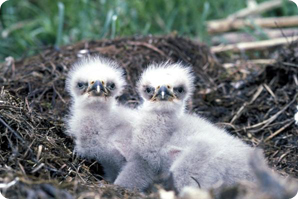 This nest of branches high on a rocky cliff is home for two small baby eagles. At first, they’re very small and helpless, just like Baby ______ who was baptized this morning. Mother Eagle is very busy finding food for them, pushing it down inside their tiny beaks and they‘re always hungry! And, at first, the wings of the baby eagles are hardly wings at all, just fuzzy little flaps, so of course they can’t fly anywhere yet, not at all like Mother Eagle who has very large strong wings with grownup feathers and can soar through the air high and low! Sometimes the baby eagles, as they’re growing bigger and more adventurous, make the mistake of hopping too close to the edge of the next high on the cliff. Out they tumble—and down they fall! The watchful Mother Eagle spreads out her big wings and swoops down under the falling frightened baby, catches it on her wing feathers, and carries it back to its safe place in the nest. There it stays until the baby is older and stronger and grows wing feathers, too! God is like the Mother Eagle. He protects his children and keeps them safe, right from the time when Adam and Eve learned to live outside the beautiful garden, when Noah’s family stepped out onto Mount Ararat, when Ruth gathered the wheat, when manna from heaven fed the grumbling people, when Mary and Joseph looked for a place to stay in Bethlehem! God watches over you and loves you every minute, and today God is here, watching over and protecting this new baby, too.